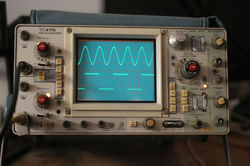 The Tektronix 475 is a portable dual-trace oscilloscope with dual time-bases similar to the 465, but with 200 MHz bandwidth and a maximum vertical sensitivity of 2 mV/Div. It is all solid-state except for the CRT. It was introduced in November 1972. A revised version, the 475A, has 250 MHz bandwidth and a maximum vertical sensitivity of 5 mV/Div. The 1106 is a battery pack for the 475. The optional DM44 multimeter attaches to the top of the instrument. The 475 uses a number of Tek-made integrated circuits, including the 155-0032-01 input preamplifier, 155-0085-00 input amplifier, 155-0078-00 vertical amplifier, 155-0091-00 channel switch, 155-0082-00 vertical output amplifier, and 155-0049-00 sweep control. 465A Time/Frequency Measurement with DM44, HP Frequency Counter used for Verifying DM44 Output. This page was last edited on 21 March 2019, at 08:28.